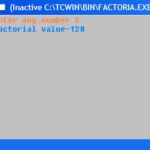 In the program below nested for loop is used to sort a list of real numbers in ascending order. This program below asks to enter how many numbers want to sort and allow to enter the numbers to sort them in ascending order. Here the value of a[j] copied to c and value of a[j+1] copied to a[j] and then value of c is copied to a[j+1]. Declare an array with float to insert real numbers. Declare integers i, j, n, c and flag. Print the message to enter how many numbers want to insert and allow to enter the number. Use for() loop to allow to enter the numbers to sort in ascending order. Use nested for() loop to to sort the list. 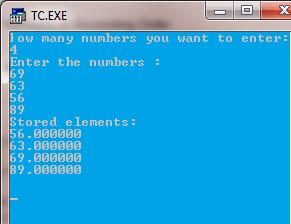 Again use for() loop with printf() command to display the numbers on screen.